Dog health for Mini Schnauzer owners... Over the next several pages, we'll examine the canine health concerns facing the Miniature Schnauzer (diabetes, pancreatitis, bladder stones, and Schnauzer bumps). Hopefully, by learning to recognize the symptoms of these dog illnesses, you will be able to get your Miniature Schnauzer the appropriate care he needs right away. This will go a long way in saving your dog time spent in pain and suffering. But before we begin, let's review the top 5 ways to keep your dog healthy and how his physical appearance and behaviors are tell-tale signs of a healthy or unhealthy dog. You love your new Miniature Schnauzer and want him to be happy and healthy for a very long time. So what can you? Here are 5 ways to help your dog be happy and healthy. #1 - Start by getting your Miniature Schnauzer to the vet. Your Schnauzer's veterinarian will be the most important person (besides you) in your dog's life. His professional advice and treatment will ensure the overall good health of your Miniature Schnauzer. So it is of the utmost importance that you find a vet you are comfortable with and trust. Is the vet's staff friendly and ready to assist you? Is the vet's office clean? Is his office located nearby in case of emergencies? Does he handle your Miniature Schnauzer gently with care? Is he happy to answer all your questions & concerns? Communication is Key: It will be important for you to establish a good connection with your Schnauzer's vet. Effective communication is key, since routinely vet visits are a basic need of your Miniature Schnauzer. OFFER: Grab your FREE copy of the Top 10 Veterinary Secrets - In this free report, Dr. Jones provides specific secrets you can use right now to heal your pets, keep them healthy, and help them live longer. 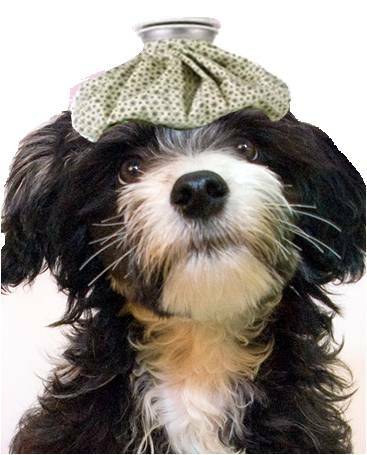 dog health tip: Always keep your vet’s phone number (as well as an emergency pet hospital or hotline number) stored in your home phone, in your purse or wallet, and also stored in your cell phone. #2 - Proper Nutrition. Many common canine health problems can be prevented or alleviated with a healthy diet. Proper nutrition is a key component to a healthy dog, as a poor diet can cause health-threatening conditions like obesity or worse. Your Schnauzer's coat, eyes, skin, weight, and energy levels are all affected by what he consumes. It is therefore important to feed your Schnauzer a high quality dog food that contains the right carbohydrates, fats, minerals, protein, and vitamins for optimal dog health. Another important factor of dog health is daily water consumption. Proper water intake will help prevent illness and dehydration which can lead to organ failure and death. How much water your Schnauzer needs on a daily basis depends on several factors including the weather, his size, age, energy exertion, type of food he eats (wet vs dry), medications he's on, etc. So be sure your Miniature Schnauzer always has access to clean fresh water. How to tell if your dog is dehydrated: To check for dehydration in your Schnauzer, grab and stretch out a piece of skin from the back of his neck and let it go. If the skin does not return to normal within 1 to 2 seconds, your dog may be dehydrated. Another sign of dehydration in dogs is dry, dull, sticky gums. You can also check by applying a bit of pressure to the gums with your index finger and release. Do the gums return to their normal pink color with a second or two? If not, that's a sign that something is probably not right. #3 - Dental Care. Caring for your dog's teeth also plays a vital role in overall dog health. Unfortunately, most dogs by the age of 3, have some form of periodontal disease, which if left untreated, can lead to health-threatening dog illnesses including heart disease, liver disease, and diabetes. Signs of dental disease in dogs include bad breath, visible signs of brown tartar build-up, swollen gums, loose teeth, reluctance to chew, tooth loss, and bleeding gums. Don't let this happen to your Miniature Schnauzer. Begin brushing your dog's teeth daily. It's the best way to keep your Schnauzer's teeth clean and healthy. #4 - Exercise Your Dog. Did you know half of the pet population is considered to be overweight? And carrying around excess weight contributes to many health risks: high blood pressure, ligament injury, kidney disease, certain forms of cancer Type II diabetes, heart disease, respiratory problems, arthritis, plus it's considered to have a 2.5 year decrease in life expectancy! If your Mini Schnauzer is 20% above his ideal weight he is considered OBESE. The best ways too keep your Schnauzer in shape are by not over feeding him at meal time (or with too many treats) and with daily exercise. Exercising your dog will not only keep the weight off but it increases blood circulation as well as provides your dog the perfect outlet to release pent up energy, which in turn reduces destructive behaviors performed out of boredom. #5 - Grooming Your Dog. Besides the obvious... enhancing your dog's appearance... grooming your Schnauzer is important for his overall health, too. Grooming your dog not only provides a comforting bonding experience for the two of you, it improves blood flow and circulation, and offers the perfect opportunity for you to check for any developing problems in the way of lumps and bumps, or other skin problems. So brush your dog daily, keep dog nails trimmed, check your Schnauzer's pads, bathe your dog when necessary, and keep those dog ears clean. By doing so, you will be helping your Miniature Schnauzer remain happy and healthy for a very long time. The best way to ensure your Miniature Schnauzer's well-being is to know the signs of good dog health as well as know your dog. ie. Know what is normal for your dog (characteristics, behaviors, and such). Performing at-home routine dog checkups will make it that much easier to detect slight changes in your Miniature Schnauzer's physical condition or behaviors ( dog pain symptoms, ) which may be sending warning signs of a potential dog health problem. Your Miniature Schnauzer should be at a good weight, his skin smooth and free of bumps, and his coat should be lustrous; not dry and brittle. 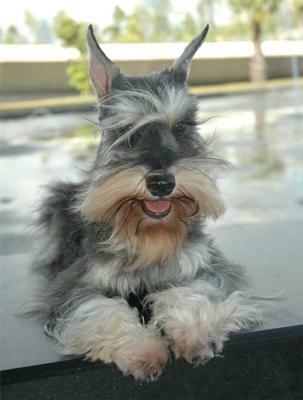 Your Miniature Schnauzer's eyes should be clear & bright and his ears clean & pleasant-smelling. Your Miniature Schnauzer should have white teeth, pink gums, and nice breath. Your Miniature Schnauzer's nose should be cool & moist. Is your Mini Schnauzer a perfect 10? Click here to take the Schnauzer Check Up & find out! A really good idea to help monitor your dog's well-being is to keep a dog journal. Make a list of your Schnauzer's normal behaviors and physical characteristics. This will better help you determine when your Schnauzer is not his usual self which could indicate there's some underlying issue that needs further attention. So now that your know the signs of a healthy dog, let's check out the warning signs of dog illness. "Knowledge Share"... If you found this article on Dog Health helpful and informative, please share it with your dog-loving friends by clicking on one of the share links at the top right or bottom of this page. 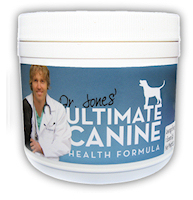 A supplement that gives your dog that extra advantage for optimum health, to fight off disease and thrive.